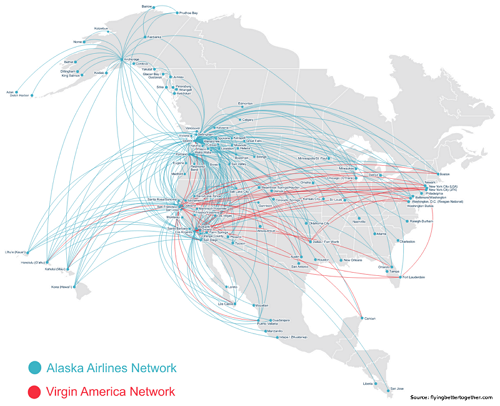 The Alaska-Virgin deal, though expensive, achieves two strategic goals: 1) it eliminates some of the competition, and 2) creates room for future expansion. As you probably know Alaska Airlines (ALK) agreed to buy Virgin America (VA) for $57 a share—that’s a 42.7% premium from VA’s closing price on April 1. While I do not like the fact that ALK may be overpaying for an airline with falling margins, I understand why it had to be done. The short-term uncertainty and margin reductions it may create notwithstanding, the deal brightens Alaska’s long term prospects. It makes the fundamental case for Alaska stronger and I will be retaining Alaska in my Large Cap Capital Appreciation Portfolio. If the price drops below $77, I may add to the position. Far From Complete; What Could Go Wrong? 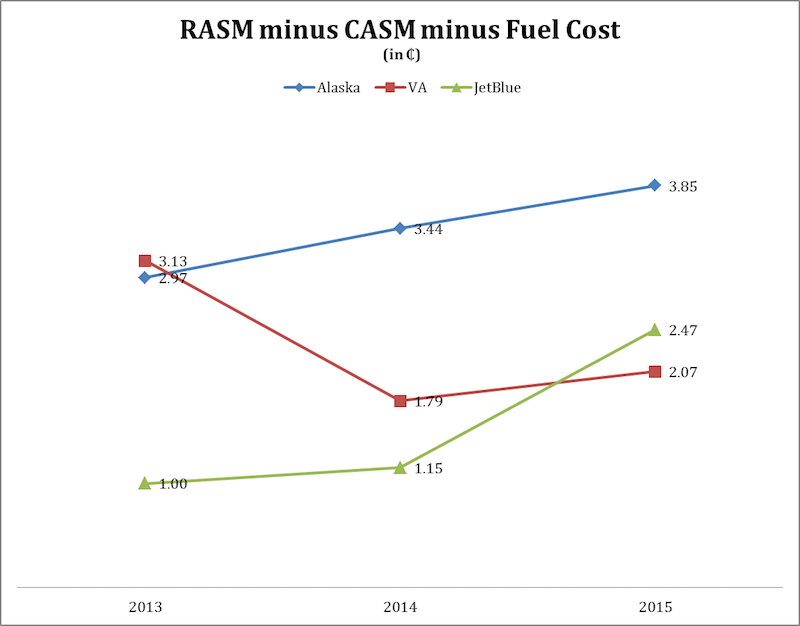 To understand why Alaska offered to buy Virgin America and at so high a price, we need to look at what has been happening to the airline market on the west coast. Specifically, we should look at passenger numbers (read: market share) at Seattle/Tacoma International Airport, Alaska’s home turf. 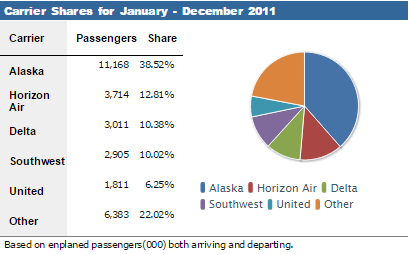 In the four years, Alaska has increased its market share to 40.82% and remains the dominant airline at this airport. Delta increased its market share to 12.74%, surpassing Horizon Air in second place. Alaska recognizes this competition and has been taking measures to defend it market share. For instance, it has increased capacity (ASM by 11% in 2015), expanded to into 20 new markets, and increased promotion activity in Seattle and new locations. All these measures would have been enough for Alaska to keep the competition at bay, but JetBlue’s (JBLU) (an east coast airline) attempt to acquire Virgin was perhaps what made the competitive threat more real for Alaska. 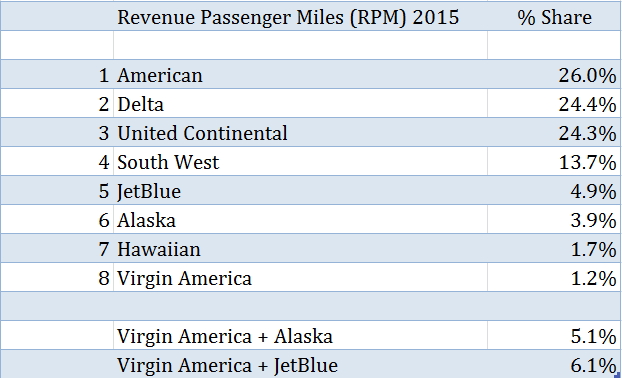 JetBlue would have increased its market share (measured by Revenue Passenger Miles—RPM, RPM = Number of passengers × number of miles flown) to 6.1% while Alaska would still have 3.9%. That, plus the possibility of having JetBlue become a significant actor on the west coast, is what—I believe—convinced Alaska to make an offer Virgin could not refuse. Alaska could simply not tolerate more competition in addition to what it was already facing from Delta. Virgin’s nonfuel cost rose 12.3% in 2015 and without a 30.3% drop in the cost of fuel, margins would have deteriorated further. 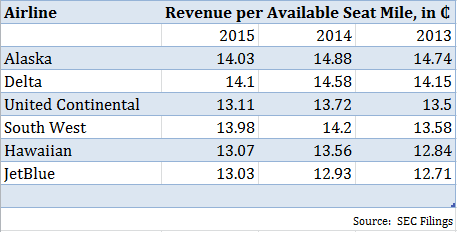 However, given Alaska’s good grip on margins (its nonfuel costs only rose 9.8% in 2015) and its historical operational and capital excellence (below); it should eventually turn the operation into a profitable venture. Furthermore, the fact Virgin operates in higher margins areas, namely San Francisco and Los Angeles, makes the challenge of turning Virgin’s margins around easier. The deal is expected to be completed by January 1, 2017, so it still has a long way to go and depends on approval by regulators and Virgin shareholders. But these are not insurmountable obstacles. Regulatory approval should not be a major concern because the deal will, as shown earlier, only increase Alaska’s market share to 5.1%. Additionally, given the large premium Alaska has offered, approval by Virgin’s shareholders should not be too elusive. The biggest threat would be a higher bid from JetBlue or another third party. But that’s the reassuring part about the offer Alaska made: it’s high enough to quell such threats, especially from peer airlines. However, there is still risk that one or more of the big four could make an offer, but then antitrust concerns would come into play because they already have significant market share. It scores an 8 on the Piotroski F Score and a 3.6 on the Altman Z Score (with a rising Z score trend to boot). Furthermore, Alaska has the highest cash as a percentage of total assets. If push did come to shove, given that the current deal is all cash, Alaska could add equity to match a higher bid. Alaska’s acquisition of Virgin is essentially a defensive move to keep Delta and other competitors from taking away its market share on the west coast. But the deal also gives Alaska the chance to play offense on the east coast. As a result, Alaska will able to grow in high margin areas on both the west (San Francisco and Los Angeles) and the east coast (Boston and New York). ALK shareholders should applaud this move.